He sent me the info the same day I asked. If he doesn't respond; repost with your email address and I'll send you the info. Tell him that Ray Turner thanks him again. Anyone out there know where to get parts? Mine has the table trunnions that are broken (underneath),the ones that you can loosen and tilt the table.....they do look a little cheesy made out of pot metal,but is something available? I found a place on the internet called The Saw Center that sells trunions, but not sure if it would work- also a bit pricey ($34.50 a pair) Interested to hear anything more. I bought my hubby this at an auction and need the manual. Can you send me a .pdf? I REALLY appreciate it! This picture seems to be what I have in the way of an old bandsaw. Do you know the length of the blade, for when I need to replace it? 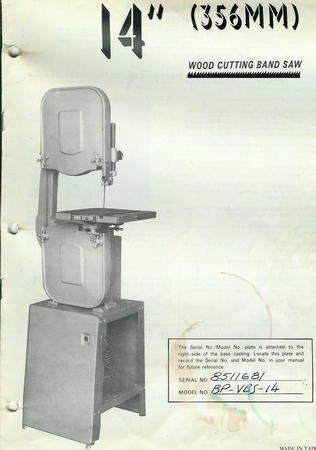 Did you ever get a copy of the manual for this bandsaw? If so, I would be interested in knowing the blade length, in order to replace my own blade, since I have the saw in the picture. Thanks. I've had good luck with replacement parts for my BP-VBS-14 bandsaw by ordering from Harbor Freight tools -much cheaper than other sources! If you click on one of their bandsaws, download the pdf for their 14" model, and then find the part you need from the exploded diagrams. I replaced the trunions, the blade guides and the upper wheel bracket that you use to tighten the blade tension. I did have to file it a bit to make it fit. I saw that you have the manual and would be very greatful if you could send a copy to me at the email listed below. I need it to be able to get a part number so I can replace a part. Could you send me a copy ? Thanks !! If you get a chance, I would like a copy of the manual also! I would like a copy of the manual also. I have been looking for parts for this bandsaw also. Could you send a copy of the manual to randrjones@yahoo.com? One of the pot metal parts on my band saw just snapped and I really hope to replace it. It's the part that allows you to adjust the blade tracking on the upper wheel. I didn't get any info from anyone after I asked each for a copy of the manual. My Dad broke a white metal part similar to the part you described. Sorry, no one has sent me a manual since my original posting. If you still need a manual for the saw send me your e-mail address and I will send a copy to you. 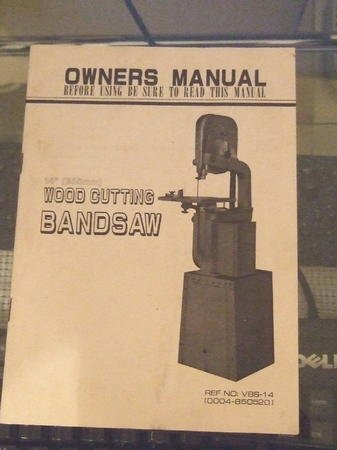 I need the operation/owners manual badly as I know NOTHING about band saws and need to learn to replace the blade and such. Thank you, please send to chrisdku@gmail.com. Also, how does this machine work as far as performance, anyone have any good feedback about them? I would like a manual if you have it... Any help you can provide will be greatly appreciated. My name is Bob and I came across an old 2008 posting about the Buffalo Band Saw. You said you have the manual and parts list. I would greatly appreciat it if you could send a copy to me. Is it too late to get a, copy of the manual? What is the blade size? I am looking for a tension mechanism for the saw that is shown on the owners manual that was posted by Potiphar 06-02-2010. I have that same owners manual and saw. Mr. Iturra has a catalog available for the asking however he does not have a website therefore you need to break down and actually call and ask for a catalog. 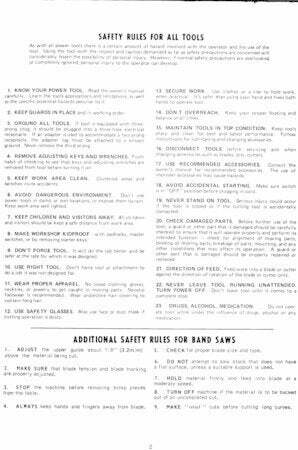 By the way the catalog could be described as a manual on repair and operation of bandsaws it is that complete. I have been trying to rebuild a '83 Buffalo 41 inch bandsaw. When I search for buffalo parts I get delta parts which seem to work. I bought some 14 in bandsaw tires which were too thin but fit. So I cut "tires" out of a large inner tube and put them under the bought tires and that worked. I also bought a blade guide that came with some phenolic cool blocks that wasn't a perfect fit but worked. NOW, I need the plastic blade guard that the back side of the blade runs through. I have seen a bunch of parts but this is never listed on any website I have looked at. ANYBODY know where I can get one? Regarding last post that should be 14 inch band saw of course. @ cf.bryant41: blade guide that came with some phenolic cool blocks that wasn't a perfect fit but worked. What brand and where can I find one? I need a whole new upper blade guide assembly for my saw. What brand and where can I find one? I need a whole new upper blade guide assembly for my saw.